Bob Bergefurd is holding a 1:16 scale die-cast Oliver Model 2455 commemorating the 2003 Louisville Farm show and made by Scale Models. 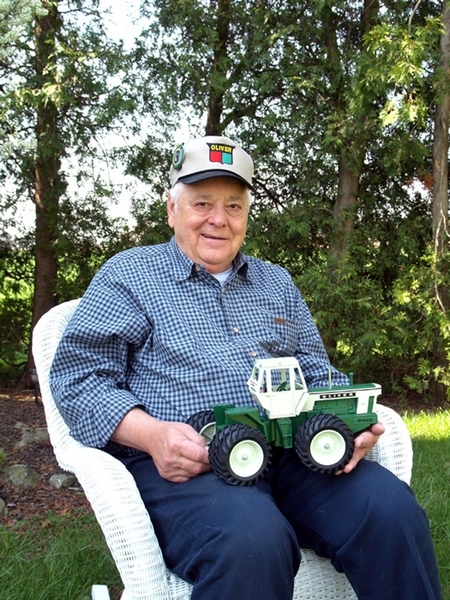 Bob Bergefurd is committed to “green” farm tractors and equipment, providing its Oliver green. As the saying goes, “Friends don’t let friends drive anything but Oliver green,” or a similar axiom. Bob Bergefurd is on a crusade to make certain everyone knows Oliver. His 1:16 scale diorama tells it all. Bob displayed his nifty Oliver Dealership at the NFTS (National Farm Toy Show) in 2009 and several Oliver equipment shows. His entry at the NFTS resulted in a second place award. Be assured, Bob will talk your color preference when it comes to farm equipment, but he understands Oliver green best. Bob and Marigene Bergefurd both grew up on farms in northern Ohio. Today, this happy retired couple now resides in the rural community of Fremont, Ohio. The community is well known as the residence of the 19th president of the United States, Rutherford B. Hayes. President Hayes dedicated a library to the town. He was the first president to take the oath of office in the White House. He was the only president whose election was decided by a congressional commission. He was the first president to have a telephone in the White House. While other presidents served in the Civil War, Hayes was the only one to have been wounded – four times. And, his best know quotation – “he serves his party best who serves his country best” was delivered in his Inaugural Address of 1877.